Each figure has its own scale bar. 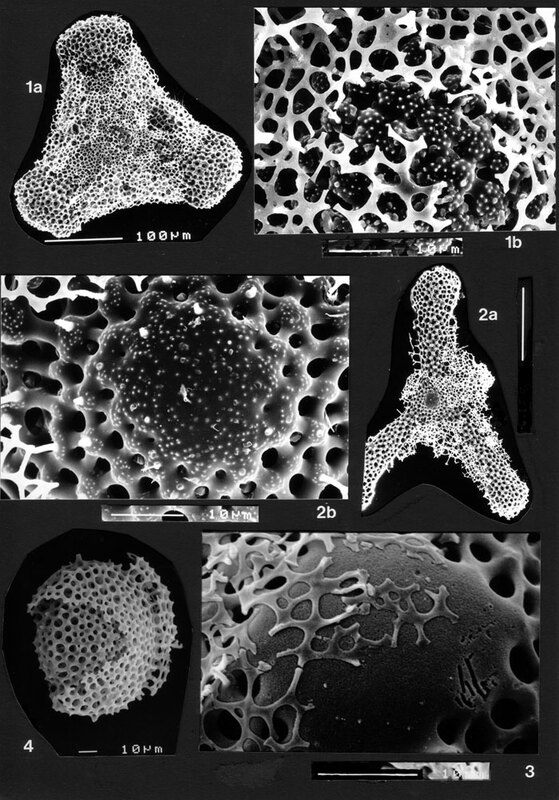 Comparison of the morphology of the central structures of spongodiscids. The two species of Rhopalastrum have poreless plates covering the central structure, while the central plate of Dictyocoryne abyssorum (and, presumably, the other members of Dictyocoryne) is porous. Fig. 1: Dictyocoryne abyssorum; fig. 2: Rhopalastrum mülleri; fig. 3: Rhopalastrum elegans (see pl. 44 fig. 7 for complete overview of specimen); fig. 4 : spongodiscid indet, showing internal structure (concentric whorls). 3x BSS 28B(II) and 107-VI-50.